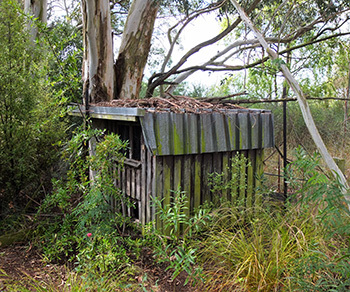 The Hen House Garden starts at the old hen house under the fence-line gums and reaches out along the water race to Duck Lawn. It began life with two distinct areas, namely a New Zealand native plants border and a Rugosa rose border. For the first time in my gardening life I was going to have one theme in one section of the garden. I impressed myself. Oops. You can guess what happened next. First some spare rugosas sneaked over the dividing path. Agnes, I'm talking about you! Then a Coprosma and a Corokia quietly joined the roses, for foliage reasons. Then the native border got bigger and all sorts of exotics muscled in. The final betrayal was the planting of two Scarlet oaks, plus some bluebells on the native border's edge. Oops. This was not the New Zealand forest look! So all the plantings quickly became completely messed and mixed up. It's a common trap for gardeners whose garden design sense consists of intuition, faith, and the contents of the local nursery's bargain bin. Maybe the same thing has happened to you. Things are not settled in here yet, and paths continue to moved around in an attempt to restore design order. The large overhead trees suffer, too, in snow and wind storms, and some winters there is much chain-sawing. The recycled rugosa roses have had to settle for afternoon sun only in high summer, causing quite a lot of sulking (and shifting). New Zealand shrubs include Pseudopanax, Hebes, Phormiums (flaxes) and Cordylines, Renga Renga, and Pittosporums, plus a beautiful New Zealand Pepper tree. There's a network of paths to explore, with one edging along the water race. 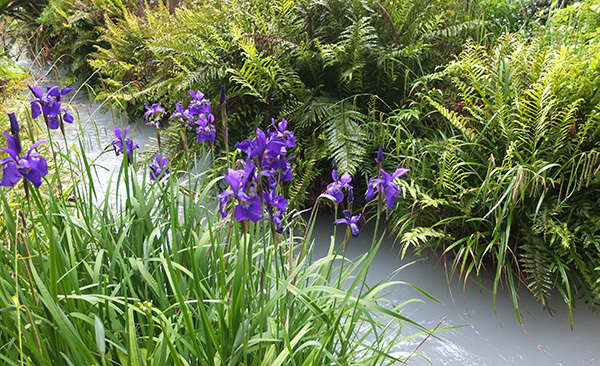 Here the more obviously exotic plants like Gunnera, Hostas, spotty Ligularias, and Japanese Irises are planted.